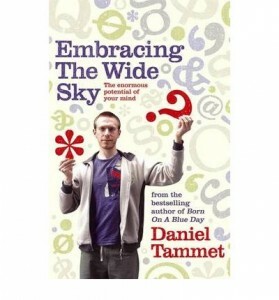 Meet Daniel Tammet, a British writer and educator who possesses an extremely rare form of high-functioning autism. Daniel suffered a life-threatening seizure at a young age that resulted in a mixture of his brain functions – parts of the brain that normally function separately, for him became intertwined and codependent. So what is the observable result of this? One of Daniel’s most publicized feats is memorizing Pi to over 22,000 decimal places in just a couple of weeks. It took him 5 hours to recite the full length of the digits he stored in his memory and he never made even one mistake. I’m currently reading his latest book ‘Embracing the Wide Sky’ which has successfully helped me locate some of my own deep seated presuppositions about learning and the natural world in general. Daniel sincerely believes his mental gifts are not reserved only for savants and even prefers that he not be “removed from humanity” by being viewed in such a way. He devotes a great deal of time to expressing his admiration of a child’s brain, believing that the key to unlocking our own brain’s potential is through a long process of unlearning and deprogramming. I will post updates after I finish reading this great work.